Joe Spuds Food Truck - Why eat your fries separately when you can eat them in the burger? Bradd inhaled this burger off the street without a single complaint. Solid option for a quick lunch-on-the-go. We found Joe Spuds at 33rd & Arch on Drexel's campus but follow JoeSpuds1 on Twitter for exact daily locations. Lucky Old Souls Food Truck - I was really blown away by the surprisingly large, juicy L.O.S. Burger with housemade bacon, smoked cheddar, pickled tomatoes, sauteed onions and special sauce. I had it back during summer, and it was worth the 9 minute wait in 99 degree heat. Look at the cheese in this photo stretched between the bun and the wrapper. Yum-o. 500 Degrees - The Humpty Dumpty Burger at 500 Degrees comes with arugula, sunny side up egg, potato crisp and braised bacon. It clearly stood out as the best of the night. One bite breaks the egg on top, making it totally messy but absolutely delicious. 500 is open late-night to feed your weekend cravings. Alfa - The Route 66 burger at Alfa, with pickles, cheddar and house sauce, is another solid burger. I don't normally choose to put pickles on my burgers but with this one, it works. The brioche bun was also good - a key ingredient to any good burger. Also a fan of the tater tots at Alfa, which are super cheap at happy hour. Update: Alfa closed at the end of 2013. Still waiting to see what takes it's place or where the chef goes. That was a good burger. Spiga - We've eaten at Spiga twice and both times the food was hit-and-miss. We were never drawn to ordering a burger, given the other Italian-focused menu options, but when I tried it at the Beaujolais event I was very impressed. The Angus beef burger is topped with herbed goat cheese, onion mostarda, Applewood bacon and spinach, creating a really juicy and flavorful bite. Update: Spiga closed too. Not shocking given our experiences at the restaurant - it just wasn't unique and seemed disjointed - but too bad cause I really liked this burger too. Back to the Food & Wine list for a sec, we have had burgers at Gott's Roadside in Napa Valley and just recently The Spotted Pig in NYC, and they were fantastic. And yes, Philly has a Shake Shack and their burgers are great, too. So many burgers, so little time! I've said often that I could probably be a vegetarian if it wasn't for burgers. My favorites in Philly are from Village Whiskey and Monks. 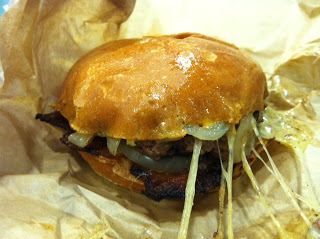 I recently had the burger at Dandelion, too, and it was very good. I haven't tried any of the burgers you have on your list, but now I have a list of burgers to try in 2013. Have you had the burgers at PYT yet? I have a Living Social voucher to them but haven't used it yet. SPTR & Royal Tavern are my faves in town. There are just way too many good burgers NOT to indulge. Wanted to share the ones above since you don't hear as much about some of them. Village Whiskey, PYT and Monks all great too. Haven't tried Dandelion's yet - or SPTR or Royal, which I know, I know, is like a local sin. We'll get there! still kills me that i didn't get to make it to that burger event!! hopefully i can make it to joe spuds soon!